I remember well the barges delivering esparto grass and coal to Dickinson’s Paper Mill, where my sister was an office worker. At one time when some of the grass was stored on part of the Moor, there was quite a large fire due to spontaneous combustion. Order on that occasion was kept by our one village policeman. We lived in the parade of shops opposite the Red House public house. My mother kept a wool shop and we lived above the shop. In those days, the parade also had a cycle shop, chemists, news agents, fish shops, dry cleaners, green grocers, bakers, grocery stores and a butcher. We were at home when the land mine damaged the church and many houses. The noise was terrific as it was when a small bomb fell one night on the rear garden of the fish shop. Little damage was done and the only casualty, (we were told) was a mouse found dead in the wreckage of the garden shed. I bought cherries at Stones Orchard at 2d lb. They were a kind of nap, white with red on, lovely and juicy. I used to cycle from Chingford, Essex to Croxley Green with the cycle club. It was called the Clarion Club. In 1937 – till I came to live in Croxley in digs. My daughter kept a horse in Stones Orchard about 1965-68 and rented it from the Keddies. Mrs. Keddie owned a printing workshop in New Road. Alf Warne-they made paper bags- used to live in Copthorne Road. We were in Bateman Road when the bomb fell. We had cousins from London staying who had been evacuated. The blast covered the bed with glass. We went down to the shelter in Harvey Road School. My father was a full-time ARP Warden called Jack Fortnum. 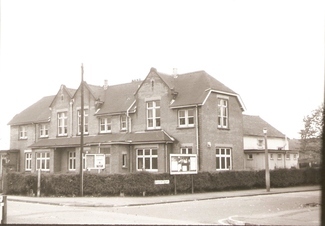 Infant-Yorke Road, Boys – Watford Road, Harvey Road ,Durrants (opened ) April 1939 left July ’39. I was about 13 yrs old and did milk round for Nabby Sears about 1938. I did the first round early in the morning on a trades bike. I put a crate with about 20 bottles and ½ pints with cardboard stoppers in. About 30 houses. I did some various roads and then went off to school. Weekends I helped him with horse and cart (float). He had an orchard at the back and a field. The cows went down Loudwater Lane in a field on the left. We used to walk them down The Green. He had about 15 cows and we had to take them down to Sansom through the woods for the bull. During holidays and weekends I helped Nabby drive the cows (he had his old bike with him) round the Green. I used to swim up near the Time Office (John Dickinson mill ) because it was safe there as I couldn’t swim very well. The good swimmers would sometimes dive off the back of the barges as they came up the canal with the esparto grass to John Dickinson. I used to take my Dad’s dinner down in his dinner basket to the time office during my dinner time. My dad worked on the big machine. During the war we were shipped into the Guildhouse at the back. Durrants. Mr Styles was sports teacher. A few boys used to play football on the fields behind Durrants. We put our coats down and a chap came over and asked us if we wanted to form a team- Bill Roberts formed Croxley Wanderers. He organised us and we had 2 or 3 teams going. We went to Whippendell woods and played bows and arrows. When the American Liberator twin bombers came down in Sarratt we went and took bits home for souvenirs. Mackintosh the local bobby came to school to see if we had anything dangerous. Where the timber yard was (near Marina ) Glixton’s (Meredith and Wise) was my first job. My dad used to buy the off-cuts from Glixton. Mr. Stone let him use the orchard to cut up the slabs of wood and bag them up for firewood. Home Guard. I used to do fire watching at the old boys’ school on duty all night and went up to Croxley House to do our training. We had a couple of sheds with equipment. I went off to Burma in 1943 and came back 1947 and went back to work for Gullet as a painter and decorator. At All Saints all the stones were numbered and taken down, rebuilt and put back. I did all the inside decorating also The Vicarage, Roefield (Gullet rebuilt Roefield). Dr. Ward lived in Roefield about 1950. When Durrants closed down we went to the closing down evening. We were given coloured tickets and we met in different parts of the school. We met in the Science room. Guild Hall fire started about midday. We could hear the asbestos crackling. A photograph in Croxley Library shows a locomotive at Croxley Mill and describes it as a fireless type, ie: boiler filled with steam from the plant. (John Dickinson mill ) The locomotive shown is, in fact a conventional loco. It was named CROXLEY and built by Peckett’s of Bristol in 1899, works no.799. It was a 040 Saddle Tank with outside cylinders. It was sold or scrapped by 1950. There were, however, two genuine fireless locos used at the mill subsequently. The first was also named CROXLEY. It was a 040 with outside cylinders, built by Andrew Barclay of Kilmarnock in 1915, works no. 1434. At one time it was used at the Ministry of Munitions depot at Gretna. The second fireless loco was also a 040 with outside cylinders built by Andrew Barclay in 1937, works no. 2049. I believe it was un-named. Finally, a 4 wheeled diesel loco was used, also named CROXLEY. This was built by Ruston Hornsby of Lincoln. Two other industrial locomotives in the area were nos. 1 and 2 of the Colne Valley Water Board used on the 2’0” gauge line which connected Eastbury Pumping Station with the Rickmansworth branch. Both nos. 1 and 2 were 4-wheeled diesel locos built by Ruston Hornsby of Lincoln in 1933. No. 1 was works no. 166015 and no. 2 was works no. 166024. No. 2 is still in existence at the Amberley Chalk Pits Museum in Sussex. We went down the moor to play and our feet got black from the sooty path. We swam in the stream in the summertime. Mum would give us some tea, usually a little bottle of water and jam sandwiches. We ate them as soon as we got there. The boys swam in the canal. Mr Quantrill was opposite the Red House where we used to take our accumulators(batteries) to be recharged for our radios. You had to be careful the acid did not spill on your legs. During the war I had to go up Woodcock Hill (we were met at Ricky station) in a lorry to Saw Mills to make bomb boxes. I was at one end of a band saw and I had to guide the wood through. I didn’t like it and left to look after children in Chorleywood. When the bomb fell (WW2 )I was in bed with two friends, Betty and Sheila Canvin. Mr. Canvin had a coal yard in New Road (near Blacksmith Gibbs). There was a big flash of lightning and in the morning we knew what had happened. We could see the red sky in London sometimes when it was being bombed. We used to go to Ricky Picture House. I remember going into the Croxley Green station when I took the children out for a walk to have a warm in the Ladies waiting room where there was a fire. Cheshires - Saturday we got pease pudding and faggots. You could always tell the time by JD- the hooter always went at dinner time, knocking off time and at night time. There was a big chimney stack. Co-op was a bustling little area. They never took any money. It would be taken and put in a gadget and would go upstairs. The bill would go in too in a screw top type jar and whizz. Clothing upstairs. Provisions downstairs. Went to Yorke Road School and left at 14 yrs and worked at Delectaland Chocolate Factory in North Watford. I cycled there on my bike – it had oil lamps and when we went over a bump they went out. We would use a box of matches very quickly. After a year went to Novabox in Rickmansworth Road. They made men’s braces. I was there another year and then went to work at the Mill – you had to be 16 to work there. 1928 I worked in Salle department “sheeting” the paper. If there were any spots on the paper it was rejected. We would count the paper into reams, some were 480 sheets or 500 or 516 depending on the quality of paper. I worked there until I married and had to leave as John Dickinson did not employ married women then. After the war things changed and I went back as an “overlooker” (supervisor) making sure everyone did their work. As a child we used to spend all day in the woods – we would take a bottle of water- we used to go and watch the Gravel workings and have a picnic on the Crusher field. (Seigewort the cement firm made concrete blocks there too). There used to small holdings (allotments) near Winton drive/ Springfield where people would keep pigs and chickens. My brother and I collected a wheelbarrow full of acorns for “Crowie Webb” and she gave us 3d a barrow load. We collected three barrow loads and bought a hot water bottle with the money. The Institute was lovely. I went to guides –Miss Barton – Smith (Froggy) was the Guide Leader. During the First World War the institute was a hospital for wounded Australians. Miss Barton-Smith was a nurse there. She had a sister Maud and her brother KAL started the Scouts. Dickinson had a “Mill Tea” when everyone took a mug. We had cakes and sandwiches. This was at Christmas and you were invited if your Dad worked there. There would be entertainment. As a Guide, (Girl Guide) we went to Chorleywood House. Lady Ella Russell owned it then. We used to dance in front of her – hornpipe and sword dance and we could use the grounds for competitions. We always had to go to church on Good Friday and then walked to Loudwater and picked primroses and had a camp fire. I joined the GFS (Girls Friendly Society) at the Institute where we could go and talk. Mrs Wilbee had her 6d hops (tanner hops). They were a butcher family from Sarratt. Every now and then she held a Ball at the Institute when the men had to wear white gloves. My Mum was a dressmaker and made many ball gowns for people in the village. If you worked at Dickinson you could pay 2d a week and you could play any of the sports at the Dickinson sports ground- tennis, football, etc. If you didn’t work for JD the membership fee was higher. I used to make the teas for cricket and met my husband there. Before the railway came JD had a sports field where the Watford Road shops are, opposite the Red House. Granny Bird’s fair used to be held there. As children we were “scared” when it came. There used to be cottages where the station is. They were pulled down and replaced further down(Watford Road) near the Scout Hut. There were 6 or 7 cottages opposite the station near where I was born (305 New Road). I lived in Carpenters Park when I married and there were lots of guns there in the war and it was a target. My husband said I should go and live with my mother for safety. They dropped a bomb on the cottages that night! Uncle Bert used to drive the horse and traps for Mrs Wilbee. I used to go to Blakes (Suzanne’s hairdresser) for my shopping. He used to roll blue paper into cones for sugar / tea etc. everything was loose and scooped out of tins. We used to watch when “Buttons” delivered to Blakes. Then my Mum would send me to queue. He was always smoking with long ash on the end of his cigarette and always used the same knife to cut cheese / ham or whatever. The Co-op was always called “the stores”. Another of my uncles was the manager, Ernie (Ernest) Chapman. Once a year we got our Divi. They used to sometimes save it for special things..
May Day – bonnets for girls, brown hats for boys. My Aunt Nellie did the laying out. Nurse Walters - chocolate lady worked at JD too. She wore brown. Sirrets another dairy where Carr’s is. We used to go up with our jug. My mother was widowed when I was 8 or 9 and the Parish allowed my mother a free pint of milk and we used to take our can up to Trenches Farm on the Green (Gallipers cottage?) on left hand side near corner going to Sarratt near Croxley House. In the summer by the time we got home it was sour! Married when I was 39 to Ernest Wright, one of the Wright brothers. My husband worked at Colne Valley Water company. I remember the Institute being built. Ladies room for pleasure where we could meet. There was a billiard room- men’s room and bar for drinks- where ladies and gentlemen could mix. Beautiful dance floor. Once a year – Engineers Ball, Firemen’s Ball. I worked in the office at Dickinson. 6 girls and one man. The big office had 100. I started at 16 and left when I got married at 39 years. Once a year exhibition- cake making, crafts such as needlework, crochet and knitting. My sister was a dressmaker. I went to London to do shorthand typing but did figure work- wages, etc. My father was head of the fire brigade- Lewis Lovitt. Co-op – grocery downstairs, clothes and linen upstairs. Lovely shop. Yorke Road- Miss Terry Mrs Seagrove. Governess Miss Dickinson. It was a church school – vicar came. Watford Road was a lane. We took our hoops and tops to school to play. Boys had iron hoops. Girls had wooden hoops/ sticks. There was one big fireplace and the Governess would stand in front so we never got very warm. During summer we went to Hunstanton for 5 weeks. Dickinson Guildhouse. I used to go in the evenings to the Ladies room and play darts or hoops. You had to be a member to do this. My wages were 15/- a week when I first started. Mill Lane was very rocky and stoney and in winter and in foggy times awful to walk down. When I married I lived in Green Lane. 4 one side and 5 the other. Little elms. There was a footpath that took us across Copthorne Road into the fields where we could walk to Latimer. If you stood by the church and looked up the Green it was one mass of white at certain times of the year, because of all the cherry trees. New Road was like a small town for shops. Gerry Sanders – butcher, Garlands fish shop, Ellements, Habers – wool shop. My friend Jack Tandy used to run the dances and socials. He lived at no. 50 Dickinson Square. His sister Phyliss used to sing on special occasions like school concerts. Strugnell- Band Master in Croxley Green. For a treat we went to Bricket Wood fair by waggonette, owned by Mr Wilbee, the butcher. We had pocket money given to us to go on different things. Neggie Wilson bought the ground at Green Lane and had a road formed. Then each person bought a plot and had a house built. Windmill - kept by Mr Holloway. He made bread and delivered it with a big basket daily. First I’ll tell you my mother and father came to Croxley Green to work for Mr and Mrs Newell of Redheath. Dad was the butler and mother one of the parlour maids. They married and set up home on Scots Hill where my brother Percy was born and later myself. We came to live on the Green when I was 18 months old. The Newells were very kind to us and we had lovely toys passed on to us. There were two daughters and two sons. . The sons were both killed in the First World War. Mr Newell had a bronze and marble plaque put in the church facing up from the organ which I still rub over every time I do my church dusting in memory of them. Once a month I have dusted the church since 1938. I went to Yorke Road School which had big open fireplaces, outside toilets and was very cold in winter. We had two hours at dinner time. Everyone went home except the children from Chandlers Cross and from over the Moor. The Green was used for many things as there was no traffic. We could bowl our hoops, skip and play marbles quite safely. We had very hard winters from 1918 to the 30s. The big boys made snow houses which stayed there for weeks. 1st May 1971 Revels. We were able to picnic in the summer down at the Chess or over the Moor. There was always something to bring home such as blackberries, bolsor plums, mushrooms, sloes and flowers and we went to Chandlers Cross once a year and picked wild strawberries which Mum made into jam -lovely. And of course there were the three Cherry Sundays when everyone sat about on the Green eating them. Nuts- walnuts, chestnuts, beech. On Saturday mornings we went down to the watercress beds and Mr Dorrofield would cut you a big bunch for 2d. We all ate plenty of it and Mum made a nice soup with what was left. I’ve always been fond of it and still make it occasionally. Dickinson’s institute (we called it the Tute) was the only hall in my young days. The school used it for cookery, housewifery, concerts, gym. The Brownies and Guides used it. There were dances, whist drives, debates, meetings and baths that took place every Friday evening and of course the Mill teas which I never went to because my Dad didn’t work at the Mill. When Mr Newell died and Mrs Newell and the two daughters moved away my Dad went to Mr and Mrs Adams of Elmcote on the Green as their butler. Mrs Christine Adams had a troupe of girls she called Flutterbys and we gave concerts for charity at The Tute. The church had summer fêtes at The Barkers which is now Rickmansworth School. It was always fine. There were games, races, coconut shies, swings and lots to eat and drink. Mrs Adams had a tent and supplied all the cooked meats- hams, chicken, tongue and brawn, etc. and my dad was there with his very sharp knives to cut them up for sale. Kate and Doris, the maids, weighed and wrapped them up and Mrs Adams took the money in her posh dress. The Hunt sometimes took place at Elmcote as it did at Redheath and we children were allowed to watch them assemble. My Dad would be going from huntsman to huntsman with trays of stirrup cup. When the master blew his horn they all moved off down the drive and we ran down the side path on to the Green and it was a lovely sight to see the hunt riding off up the Green in their scarlet jackets and the hounds running in front. I joined the Girl Guides in 1923. They met at the Tute. We had a club house, gym and dancing and worked for badges. The uniform was a loose navy blue dress, belt and big round hat. We lost all our ‘ logs’ (record books), etc in the fire at the Tute. When I was young the Brownies were called Rosebuds.In the 50s, I was Brown Owl for about six years. I still test for the Guides and Brownies. I went to work for Miss Holloway who lived at the windmill and had a drapers shop in Wealdstone High Street. Mrs Carr, who was the M.U. enrolling member at that time, told my mother she was looking for a young girl to serve apprentice. So there I was till I was 18, living in at the shop. Miss Holloway and Miss Wright came home at weekends in a taxi and I came home on the train and went back on Mondays from Watford station. Then I went to Harding’s in Queens Road as a window dresser and served at the hosiery and glove neck wear counter. I left when I was 21 to marry Les in 1933 and we used the church hall coffee room for the first time for our reception. Mr and Mrs Adams moved to Camberley and Mum and Dad went with them. That is how we came to buy the house from Dad. Parachute bomb. Mr Cameron ( Home Guard) and Mr Graver (special constable) were on duty. The house moved! The back door blew open and the landing ceiling came down. Some days later the fireplace moved just a fraction. Although we actually lived in Watford, I always loved Croxley. I used to go with friends then to fish in the watercress beds and streams nearby, for tadpoles and tiny fish, bringing them home in a glass jar with water. I can’t remember keeping them for long and certainly not what happened to them! I think I waited for some frogspawn to hatch but wasn’t very keen on the poor tiny frogs! Talking of frogs, I expect many people remember the Halfway House pub, situated at the river’s edge at the side of the first bridge on Rickmansworth Road. When I was about six my father and mother began to give me a great treat – walking down there after Dad had got home from work and mother and I used to sit outside at one of the wooden benches and tables and await our drink to be brought out by my Dad. Mine was always ginger beer! I know that my mother was very brave to walk down there past the water splash on our right because she was just terrified of the frogs that crossed Ricky Road. It was more like a lane in those days and quite muddy sometimes but very nice for frogs! A bit later on I learned to ride a bike! 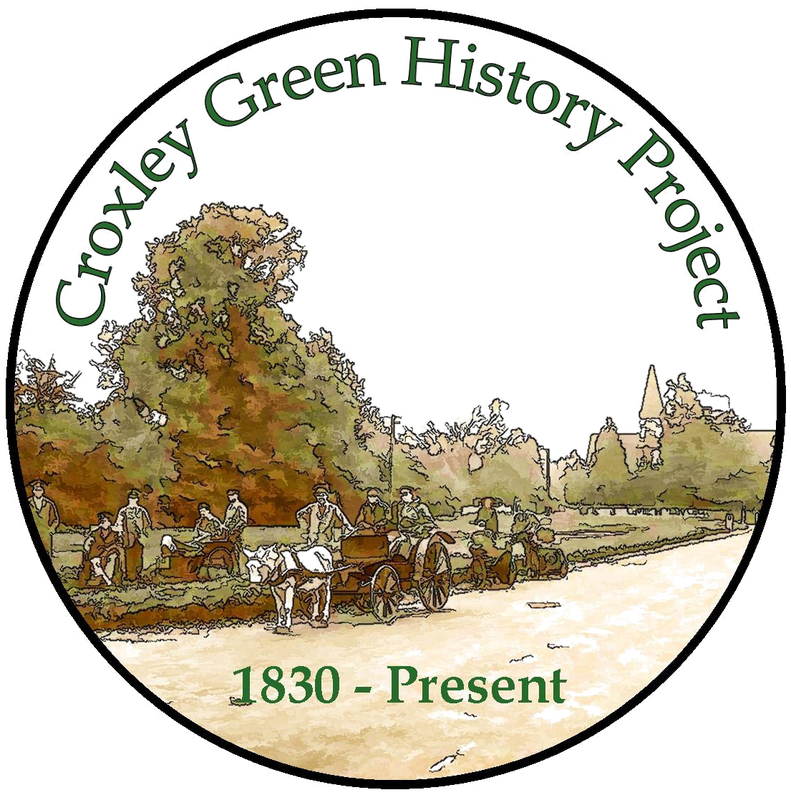 Croxley was often our target and the Green was our usual destination on a fine day. At one time I had to ride to fetch our milk- along Baldwin’s Lane to the farm there and back. I can’t remember why our milkman couldn’t come but I suppose there were strikes, even in those days, neither can I remember the name of the farm I had to go to – maybe Mr Foster’s? My father joined up to the Army in 1914, the same year that I started school at “Gartlet” in Clarendon Road. My Dad was injured and sent to a convalescent camp but came home safely – we thought – but he died later of his injuries in 1921 when I was 13. Not long afterwards the Peace Memorial Hospital was built, as a “peace” memorial to those who had lost their lives to the War. I was in the Guard of Honour when Princess Mary opened it, so have been very sad over the years to see it gradually crumbling away. Anyhow, it’s a happy story at last as it is soon to be a finished re-build as the Peace Hospice which I support all I can and so do lots of others. Returning to my beloved Croxley Green, I can of course recall the Second World War and the awful bomb that damaged the church on the Green. My mother had taken a job at sea between the wars to earn some money to keep us and we moved to Hampermill Lane in Oxhey to a newly built house for which we put down £40.00 as a deposit to buy it! When the bombing got bad we had a shelter built in the garden and the bang of the Croxley bomb sounded yards away across the fields, not miles. I still enjoyed cycling to Croxley and Rickmansworth and it was always such a pleasure to do that when all was so sad in the world. I do of course remember the finish of the War and it stuck in my mind how effective New Road looked where the tiny cottages are along the right hand side towards the Green. The occupants had tied lines of flags from their windows to their gates so that the whole road had slanting lines of flags billowing in the breeze! In 1946 I got a decent job with the John Lewis Partnership, so we were able to move again to a bungalow in Croxley Green!! It was then that I became very interested in gardening and so joined the local clubs- The Horticultural, The Croxley Flower Arranging club, the Townswomen’s Guild, etc. I made many good friends. At a show I was asked to put on a flower arrangement depicting Croxley so I asked Mr Foster, the farmer on the Green itself, to help and I still have a snap of my effort with produce from Mr Foster. I don’t have any near relations in England so after my mother died I looked up some cousins in New Zealand and have now been “Down Under” four times. I love going for Christmas (their summer) and finding the roses in bloom. Whilst there on my first trip I was quite amazed to see, on looking in a stationer’s window, a lot of notepaper marked “Croxley”! I enquired about it and found that they had bought the rights and it is now made in New Zealand. I have a pad of it which says “Croxley – made in New Zealand” ! So it is nice that our tiny Hertfordshire village gets a place “Down Under”! Gospel Hall – I remember it being made of green galvanised sheeting with a board up in front saying Gospel Hall. Joe Foster father had a long white beard. Pitkin lived next door to us on Scots Hill. Next up to pub was Mrs Windows, draper. Behind was boot repairer in shed. Three houses before was my Auntie’s shop which sold everything- pots, pans. Walter Gibbs’ cart. Youngest (Denis) made the cart and did sign writing. I went home to bed and then heard air raid sirens and got up to do my duty. I was sitting on a windowsill at Eagers (now Luxton’s) fire watching with three friends and decided to move round the corner. When the bomb dropped the windowsill disappeared and I thought my two friends were dead. The Dairy was bombed – all the roof was on my bed. The front was blown in and the roof blown off the George and Dragon. The cow sheds blew over and the bull was walking around with his post round his neck. Kinch in New Road let us milk our cows in his sheds. Cricket. We walked to Sarratt and then through the woods to Chipperfield Common. We cut up sandwiches in the school and took them in a bath! Tea after match for players and anyone watching. Once a year Neggie took the cricket team to Lords as a treat. We would sit on the grass. Afterwards we went to Regents Park and he treated us to a ride on the boats. Mowers were stored at Little Gillions sheds. We had a long metal tube with a point at the end with weed killer in it to kill the daisies. Roller came from JD Mill with hook either side attached to thick ropes. It took 10 boys each side to pull it. Nabby worked at Parrott’s Farm as a boy for Jackie White. His Mum bought the horse. He bought up apples and potatoes to sell- started his own business. In the 1914-18 war we had half day holidays like Ascension Day. When Bill Dorrofield won a military medal he came to visit the school in uniform. We had half a day then. He was killed afterwards. We were asked to collect acorns for the war effort and there were more oak trees in Croxley Green then. There were three five- barred gates. One led to Parrott’s Farm, one to Stones Orchard .There was an oak tree in Owen’s Way and one in Springfields. We used to look in the woods too. The acorns were stored in the coal sheds at the back of the outside toilets.. There was a considerable amount of acorns. Pigs ate acorns. They were collected for ammunitions and after the war they were sold and the money bought a flagstaff. I was about 12 years old. When the old boys’ school closed the flagpole was taken up to Durrants when Mr Jefferies was Headmaster. Games. We played “outings”. There would be 6 or 8 of us. 4 would go off and the others would look for us. They would be looking all day sometimes. Bunny and Geoff Squires first cut the cricket pitch on the Green. Bunny wrote a book and Geoff illustrated it “Life as an Estate Agent”. They interviewed Neggie. They were heroes to him. They won the Wicks Trophy. After school we used to go and roll the pitch sometimes for an hour. Even if you had a paper round to do you were not excused. The outer field had to be dug up to remove plantains. We used our penknives. Neggie expected a big pile of weeds when he came up. My mother went to work at the Mill. She wore trousers so they wouldn’t get caught in the machines. Mrs George bent over and all her long hair got caught in the machines and pulled it all out. My father was in charge of two paper making machines at John Dickinson’s. It was so noisy they had to talk in signals. Grandmother looked after us. We used to “skip” her. She could never find us sometimes. Stones Orchard had a damson tree on its corner. There would be four or five larger boys over there and us three boys were indoors drawing. Mother was putting out the washing and we skipped out, went over to the Orchard and joined them. George came out and we ran home and started drawing again. George came round to the house. “Mrs Hedges, your boys have been after my damsons”. Mother was shocked and told him we’d been in all afternoon. He couldn’t make it out. It was important to Neggie that everyone helped to plant a tree. My brother had a tree for George VI but it was too tall. King George VI’s tree was dug out of Nuttfield. I hadn’t got one either so I went and dug one up too. We had to get permission from the Council to plant them. Shall I tell you about the bathing in the canal? We used to go in by the lock we called the FIRST and further down was the SECOND and opposite the Stone Crusher was the THIRD. This is where the babies went in. The crane used to swing over the road to the barges and where the sand spilled out into the canal it was nice and soft for the babies. Near there was a cattle bridge. I learnt to swim down the canal and I went when my Mum wasn’t looking. I wasn’t allowed to go down to the water until I could swim! We made fires from the cow pats to dry our towels. The Red House flew a tatty Union Jack. Barton-Smith told the landlord he should be ashamed, so he bought a new one. Barton-Smith lived at Lindeswara, Watford Road and when it was the Boat Race he flew the Cambridge light blue flag or the Oxford dark blue one, depending on who won. I used to climb my fence to see who had won. 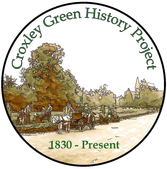 The First Croxley Scout Group was formed on the Green. Miss Kirnan and her mother lived in the house (Fearnside). There was a stables and room for a carriage and we had a gym in one. Horace Rookes (son of paper maker at JD) was a patrol leader. The Duke of York pub had the Hotspur Quoits Club. Cherry Sundays – more of a pub Sunday. They came in brakes and carriages. The pubs on the Green had orchards too. The black caroons were so black we couldn’t pinch them because the stain around your mouth would show! You couldn’t fall out of a cherry tree, just into it. Some people climbed to the top for a dare. You got into bed dear and pulled down the blind! To bid you good morning, good morning my dear. Put those blooming Woodbines out! Neggie Wilson was a lovely man, respected but very strict. He was very generous to the village and the boys. One day Neggie wanted to make some goalpost sockets so he said, “You two go and fetch the wood” I think we probably went to Walkers in Ricky. They were great friends. We had to get 16 pieces, 4 for each post and we had to get Elm wood. It was so heavy to carry back. We tried floating it back on the canal to save carrying it up the hill but we still had to carry it up from the canal. We were gone all morning and Neggie said: “Where have you been, boys?”! The boys in the village used to go skating on the pond when it froze over. There was always grass and bits in it so it wasn’t easy. There was a kissing gate at the top of All Saints Lane. I used to do errands for Sally Young. She stayed upstairs and let a basket down from the window with a note and money in it! Did you know the bridge down by the canal had gates under it to stop the cattle wandering under it (River Gade) You can still see the hinges. The Samuel brothers went to Pinewood Studios and made the models for the films. They were very clever and created the big models for the processions, like the Elephant (Revels or Jubilee) 4 or 5 men sat inside working the legs with levers to make them walk. The Dickinson Institute became the Guildhouse when the House of Dickinson formed their own trade union. The Tank was behind the Institute and was the water supply to Dickinson Square. The building underneath was where the Rovers met There was a rifle range around the back. The Institute had the best dance floor in the whole of Hertfordshire. Mrs Paterson was the draper. There was a fire one night when a spark fell from the gas mantle and started smouldering. They fetched an old trolley from the Institute but there was no water. While they were trying to devise a way of getting water up, the Ricky Fire Brigade arrived. “It’s ours!” they said because they got paid for each fire then. John Dickinson had its own fire brigade. It was wonderful- pulled by two very smart horses. Each Mill had a fire brigade (Nash, Apsley, etc.) and they had competitions in the sports ground. I worked for Sirrett the milk people first (at the back of Carr’s) when I was 14-16 years old. Then I went to work for Henry Kingham. I was a ‘nobody’ so I asked to go on the transport. Did you ever see a van with a pig on the side? I used to drive for Thomas of Harwoods Road, Watford (grocer). I left when I was about 23 and bought an old Ford van for £5 from Horton’s, Watford, and started my own delivery. Sid King in New Road (where Evans Close is) owned land and we kept the van in his shed. We moved to 7 Frankland Road in 1934 and took over Helliwell’s at 136 Watford road. It was originally a dairy (vets now). We had a shop there. When we moved in there were layers of oil cloth on top of each other. The floors were rotten and there were loads of silverfish everywhere. . We had to replace the floor with concrete. On Wednesday afternoons when the shop was closed we went ratting. There was a nest under a shed at the back. Once we sent a ferret down but he wouldn’t have it and came out with his hair standing on end!. We got rid of them in the end. My Austin 10 van cost £245 in 1934. Celebration of Coronation of George VI. My van was decorated at the front with a bust of the King carved in soap. The soap came from a firm in Preston. George VI oak died several times. We knew where the spot was because Lewis Fry, Neggie’s nephew, sat next to me in class. My brother dug the hole and found the remains of the four iron posts. I started my business in my garage behind my house in Frankland Road. This was doing a round- delivering provisions to the door. Travellers would come to Croxley and visit all the local shops to take orders. They were from companies like McVities, Heinz and Chivers. Heinz travellers were always big people. Golden Acre butter was made at Nestle factory in Aylesbury. Behind my house, 7 Frankland Close, they dug out gravel (where Weston’s haulage is). They filled this hole in and used the effigies (plaster models of Primo Carnero and King George VI that came from Madame Tussauds in New Road. My shop was very good for provisions. I was good for cheeses. I also kept hardware under the stairs. A lb (pound) of nails was 2d. One chap asked for a broom handle – 4d it was. He said, “I can get it a 1d cheaper in Watford!” We kept paraffin in the back. I gave up my shop about 1971 just after decimalisation. Everything had to be priced by hand. The coupons were sent down to Rickmansworth. People had to register with a certain shop. Food Office in the grounds of Basing House. Shops were registered to a certain wholesaler or distributor for different produce. Residents then registered with local shops. For a certain number of residents the shopkeeper would be given points so that he could have produce that wasn’t rationed. Customers would have points allocated to them in their ration books. They dropped an oil bomb on Winton Drive by the British Restaurant, the cottages by the station and the fish shop. I think it must have gone down the well as it only split the cottages up. I was a founder member of the Camera Club. We met in the Science Room at the Institute. Harry Packman was good at photography. I always got commended but Harry got lots of 1sts. The BBC came along to make “The Spirit of the Age”. I got £20. I was sharpening my saw. My wife was in her deckchair. ITV came along another day to film on the Moor. They wanted electricity and when we refused (initially) - they gave £10 to a charity. I think it was for the children’s programme “Grange Hill”.